Business InsiderApple decorations across the street from its big event in San Francisco. 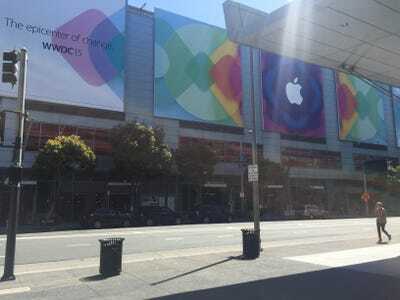 Apple is kicking off the biggest event on its annual calendar today, and we’re on hand to bring you the highlights from the keynote as it happens. This is where Apple usually introduces new versions of its software and services, giving the army of people who make apps for your iPhone, iPad, and Mac, ample time to start building before the next versions come out. Apple’s long-rumoured answer to Spotify, which will let Apple owners pay $US10 a month to listen to millions of songs on demand. The rumoured name is Apple Music. The next big software update to iPhones and iPads, called iOS 9. It’s supposedly going to include an improved version of Siri and the ability to run apps in a split screen on the iPad. But the big focus is actually going to be better stability and making sure it runs smoothly on older devices — important, but not very exciting. More information about HomeKit, Apple’s plan to let your iPhone or iPad serve as a remote control for home devices. A new version of Mac OS X. There could also be some surprises, like a new version of Apple TV (although the rumour mill said that Apple scrapped those plans at the last minute) or information about the next iPhone or iPad’s hardware. The conference is for developers, after all, so we polled some of them to see what they were hoping for. Wishes include better tools to build apps, more stable iOS and OS X software, a way to respond to user reviews in the App Store, and way more access to the watch. Follow along below as we bring you the keynote speech — the only part of the event that Apple opens to the press. Our coverage will kick off around 11:30am ET on Monday.